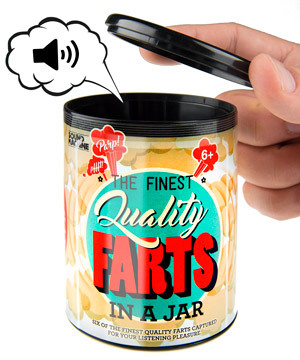 Farts in a Jar: A collection of gassy sound effects that doesn't stink. “Pull my finger” just got an electronic upgrade. Farts in a Jar captures the fun—but not the funk—of letting one rip. Lift the lid of the plastic jar to activate the light sensor inside and trigger a sound of human flatulence. Keep opening and closing the jar to cycle through all six nasty noises from the long and wet to the short and squeaky. We don’t know how these sound effects were produced (or what food was involved), but we do know that this delightfully childish sound machine is a fun gag gift that won’t make you gag. Farts are a time-tested way to get a laugh, but that joy comes with a terrible price exacted upon your nose. 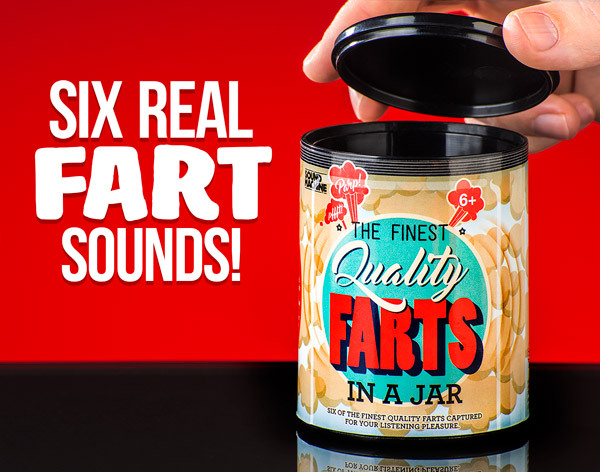 Farts in a Jar captures the haha without the eww, producing a stinkless stinker every time you open it up. It’s a fun way to cheer yourself up and get a chuckle from your equally sophisticated friends. All of the sound, none of the fury. Vat19 is no stranger to bagged and bottled farts, so it only made sense to share a jockey burner in a jar too! This can of cut cheese packs six different fart sounds into a plastic sound machine. The light sensor inside the jar activates the speaker when the lid is opened, treating you to a quick hit of an audio air biscuit you would normally have to find a funny uncle to hear. Question: Are the fart sounds played at random? Answer: No, the six sounds in Farts in a Jar are set on a cycle so you never hear the same one twice in a row. Question: How bad do these smell? Answer: Not bad at all (unless you add your own SBD to the mix)! Farts in a Jar merely produces a convincing sound effect, not an actual (stinky) fart.